Manulife Financial’s CoverMe Packing App, which we designed in partnership with the insurance company, reached a major milestone in the App Store this week. And, we couldn’t let it go unnoticed. To congratulate our clients, we wanted to mark the occasion with a travel-related gift. 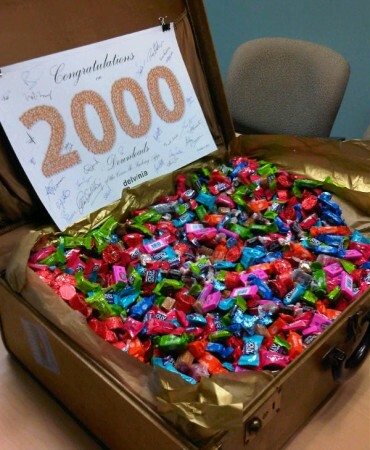 So, the Delvinia team filled a vintage suitcase—which we covered in stickers from destinations like London, Paris and Rio—with 2,000 pieces of candies and hand delivered it to the company’s offices yesterday. The award-winning app is among the top five most downloaded packing apps in the Canada App Store. Available for the iPhone, the app is designed to help travelers with the process of planning and packing for their trips. Users can download the free app to create customized travel packing lists from categories like Important Documents, Clothing, Toiletries, and most importantly Travel Insurance. Since its release in December, the app has won four awards, including a Bronze Stevie Award in the 9th annual International Business Awards, an Outstanding Mobile Application Award in the first annual MobileWebAwards Competition and two Silver Awards of Distinction in the 2012 Communicator Awards. The CoverMe™ Packing App can be downloaded for free from the iTunes Store. For more information about the CoverMe™ Packing App, please see the case study in the Work section of our site.